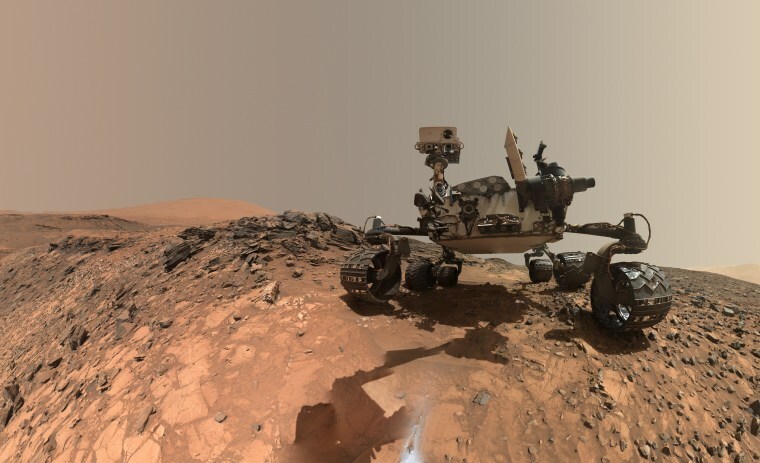 NASA's 'Curiosity' has found tantalizing evidence of organic molecules on the red planet. New discoveries by NASA's Mars rover Curiosity add to a growing body of evidence supporting the idea that microscopic organisms once lived on the red planet — and have some scientists considering the possibility that microbial life lives there still. As described in a pair of scientific papers published Thursday in the journal Science, Curiosity detected carbon-containing compounds in ancient sediments on Mars and shifting levels of the organic molecule methane in the planet's atmosphere. "Both these discoveries are breakthroughs in astrobiology," Inge Loes ten Kate, an astrobiologist at the Utrecht University in the Netherlands, said in a written commentary published along with the papers. She said "the question of whether life might have originated or existed on Mars is a lot more opportune now that we know that organic molecules were present on its surface" in the distant past. Years ago, Curiosity found evidence that liquid water and the chemical ingredients for microbial life once existed on Mars. But in one of the new discoveries, the car-size rover found that levels of methane in the Martian atmosphere vary widely from season to season, with levels peaking at the end of summer in the planet's northern hemisphere. In the paper about the new finding, Christopher Webster, a senior research scientist at NASA's Jet Propulsion Laboratory in Pasadena, California, and his co-authors conclude that "there remain unknown atmospheric or surface processes occurring in present-day Mars." Methane can be produced by nonbiological processes, but on Earth it's created mostly by microorganisms. So what's causing the varying methane levels on Mars? The possibilities include reactions between water and rocks as well as "possible biological activity," Kirsten Siebach, a planetary geologist at Rice University in Houston, told NBC News MACH in an email. The rover also found that sediments dating back more than 3 billion years contained a variety of organic molecules, a discovery described in the other paper, which was co-authored by Jennifer Eigenbrode, a biogeochemist at NASA's Goddard Space Flight Center in Greenbelt, Maryland. Siebach said that while neither of the new discoveries "require life in the past or present, they present compelling evidence that Martian life could have existed in the past, that if it did we have a chance of finding evidence of it, and that there are ongoing reactions deep below the surface of Mars that could potentially be related to liquid water or life." Curiosity, a tool-studded robotic vehicle weighing about 2,000 pounds, has been exploring Mars and conducting experiments for almost six years. It was launched from Cape Canaveral on Nov. 6, 2011, and landed on Mars on Aug. 12, 2012. Want more stories about the red planet?